Well this was not in my plan. 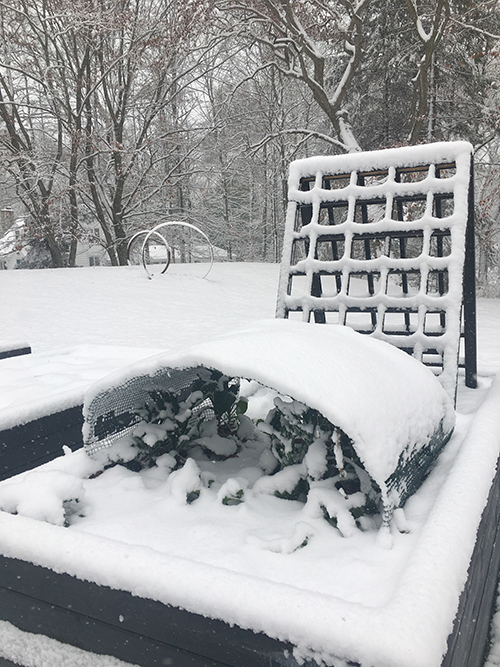 An early season snowfall has put a damper on my fall gardening plans and even worse, it has pretty much killed any desire I have to be in the garden. 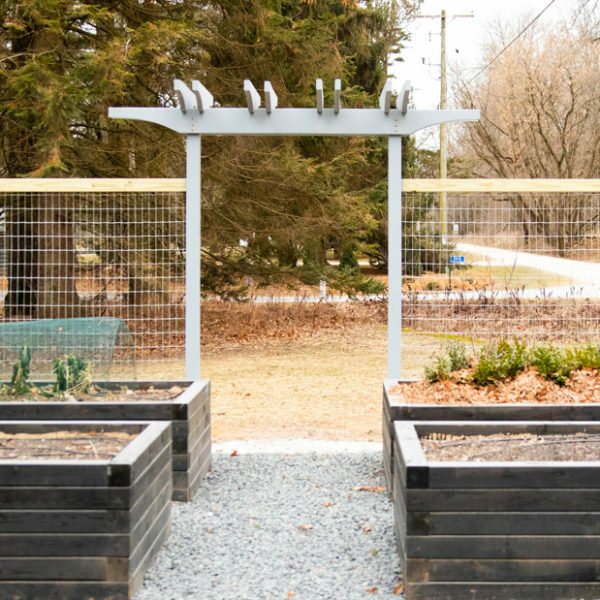 It’s just so hard to get inspired to garden when the option is getting your winter gloves dirty or freeze wearing just your gardening gloves. Snow this early in the year in Wisconsin is not unheard of, but it is very rare that it sticks around. So although I knew snow was on the way, I didn’t think much about it because I assumed it would be gone in a day. Yes, I’m complaining about the weather. One thing you need to know about midwesterners is that it is basically our birthright to complain about the weather. Frankly, it’s the only thing anyone talks about when the Green Bay Packers aren’t playing (and let’s be honest, this year what they are doing barely counts as playing). But I recognize that my whining about the weather here is completely ridiculous given the almost unfathomable devastation millions of people in California are facing. 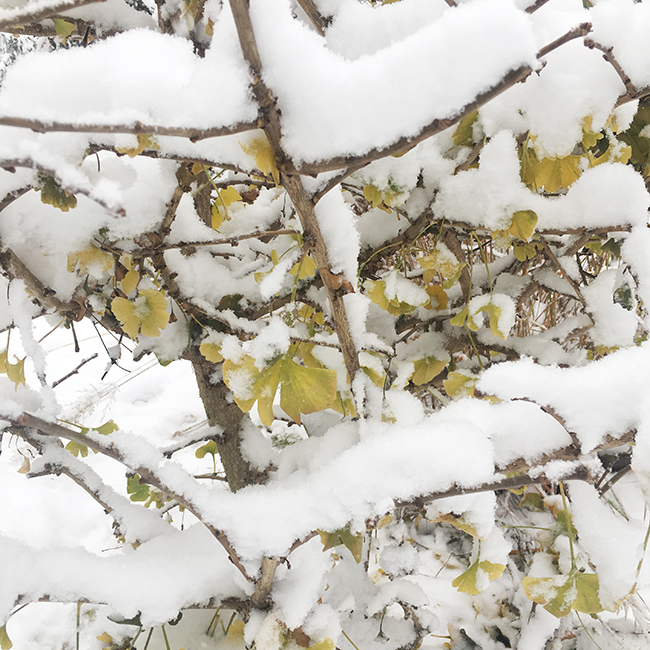 The poor ginkgo didn’t even have a chance to drop its leaves before the snow came (and stayed). The Lacinato kale survived the snow and the cold, but I’m not sure how much more it will withstand before it gives in, just like this gardener is feeling the urge to do. The same view of the lovely golden-hued climbing hydrangea on the garage, taken 24 hours apart. But one can only procrastinate on fall gardening for so long. Well, if you’re going to do it, that is. 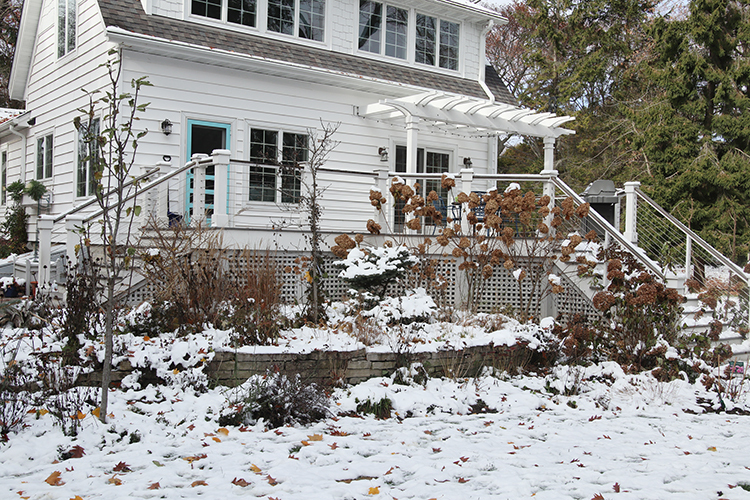 So spent the weekend planting the last of my bulbs (using my auger in the snow) and heeling in plants still in pots. This is an annual ritual for me. I “plant” things that are still in containers, either on purpose or because I ran out of time, into one of my raised beds. I fill in the soil around the containers and then mulch with shredded leaves for some extra protection. This method has been very successful. In fact, most of what I heeled in this year was a collection of boxwoods I’ve been growing in pots for three or four years. I bought them as inexpensive plugs, knowing that I wanted a boxwood hedge somewhere at some point. 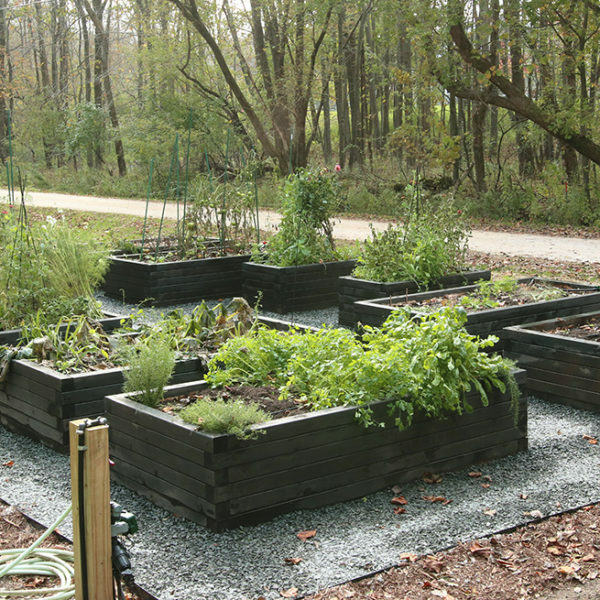 Many have been growing in gallon pots and a few were moved up to three-gallon pots. Those in the larger containers are much happier and many of the gallon-size plants are pushing so many roots out the bottom of the pot that I’m going to have to cut them all off to get them out. Surely they would have been happier in larger containers. Fortunately they will all get permanent homes next year. 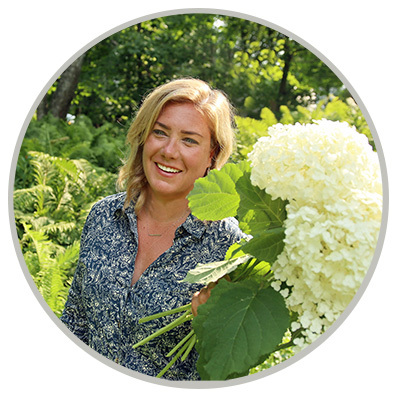 I’m going to plant a cloud-pruned hedge of boxwood in front of the vegetable garden. 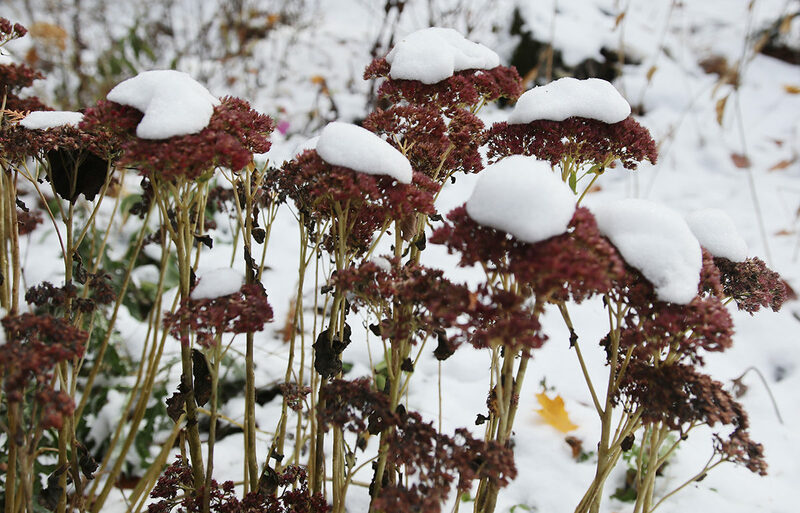 The sedums, which I always leave standing for winter because it looks so nice with snow “hats,” is still a pretty ruby red. The rest of the garden cleanup is on hold. I didn’t have a chance to cut anything back before it got very cold and snowy. Usually I cut about half the garden back, leaving things that provide food and shelter for birds standing and cutting back anything that just flops. If we get a warmup that allows me to do some of that, I will, but given the weather and my lack of enthusiasm, there’s a good chance that what it is now is what it will be for winter. With the exception of protecting my roses (I’ll be doing the same thing I did last year because it worked quite well) and moving my containerized shrubs into the garage, nothing else must be done this fall. 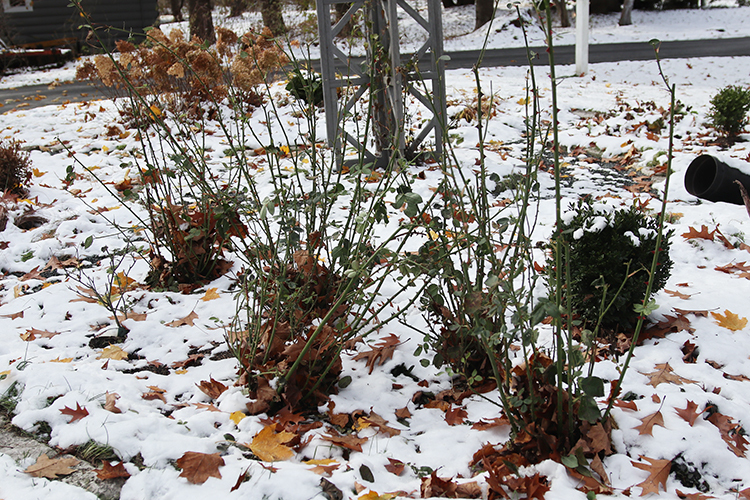 The roses still need to get their winter root protection. All those leaves mixed with snow is sort of driving me nuts. And you know what? 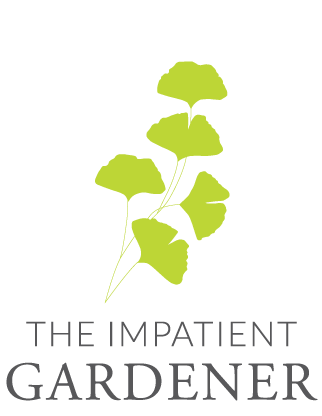 That’s OK. For as much as we fuss about the right way to do things and the right time at which to do them, gardening is pretty forgiving. What doesn’t get done this fall, will get done in spring, and I’ll be a lot more excited about it then. Ha, I feel your pain. It got entirely too cold here for this time of year. I didn’t believe it would happen. When I looked out at the fountain it was frozen. UGH.. I think my pump survived. It thawed enough a couple of days later that I could get the pump out, dig out the ice and cover the fountain. I think this is about all I will do until next spring. I will get the rest of the leaves off the grass paths but that will be it. I will wait for a warmer day though. Next three days will be inthe 30s, so I will finish raking, cage valable shrubs and put down a winter mulch of chopped leaves. We still had some snow from our Friday storm. Have a bucket of kitchen compost and can’t unhook the lid of my bin which is in very cold shade. Really not ready for this, but given the weather this year I was assuming it would continue to be strange. I am in Wisconsin and I was not ready for this cold snap. I’d gotten a bunch of clean-up done but there are a bazillion leaves to mulch for the leaf mold pile. I’ve never heeled in plants but last year I buried some late season bargain perennials in my leaf pile and they all survived. Now I’m just hoping the ground thaws out enough to do the holiday decorating. No snow here yet but days of cold rain has definitely put a halt to outside activities. Actually looking forward to raking leaves of they ever dry out. Have emptied my large containers but still have lots of Tulips to plant in them. Wish we could send some of this rain to California. Such devastation Can’t even imagine living through a fire. All our prayers and love go out to those suffering and loss. Let us count our blessings next week. Happy Thanksgiving to all. We had the same thing here in MN, maybe a little earlier actually! 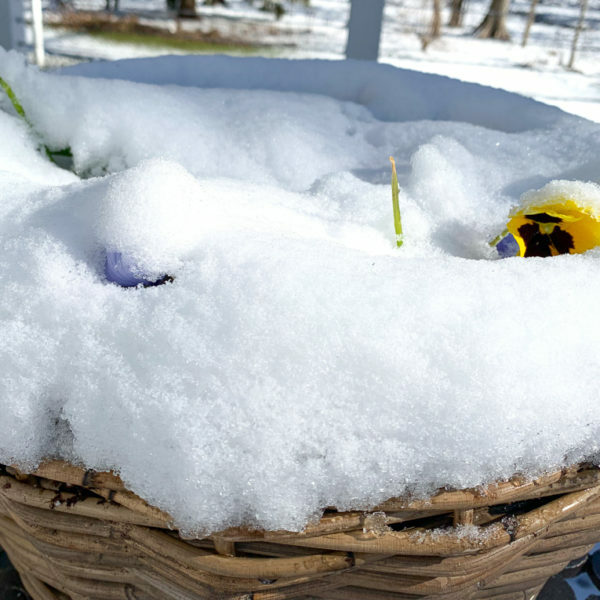 It was a surprise and I still need to plant some bulbs….hopefully I can do that when it “warms up” to 40 this week. I think winter came too early for a lot of the country. We had our first freeze about three weeks early—or even earlier than in more recent years, a month. Not used to seeing this weather until December. Everything looks spectacular in the snow! Even the trash can and the pile of bricks, and all the other messes in my yard.